petWALK Pet doors are built very robust and have proven themselves over many years in the global heavy use of the tropics to the Arctic Circle, by beautiful family house to shelter. Nevertheless, you are highly complex devices where sometimes have problems or questions may arise during operation. In the following sections, we show you how you can fix most problems quickly yourselve. This error message is displayed when the door leaf is blocked during the opening process. If this blocking item is removed at the next opening attempt the petWALK pet door will operate again normally. For information purpose the error message remains on the display. Check if any object prevents the petWALK pet door from opening or if any other reason exists which stops the opening process. If you have removed the blocking item from the swivel range of the pet door, confirm the error message by pressing the OK button on your remote control. The error message on the display will disappear. This error message is displayed when the door meets an obstacle during the closing process and thus is not able to close. If the door meets an obstacle during the closing process, it will stop immediately. After a waiting period of 2 sec an acoustic signal will sound and another closing attempt will start. After the 3rd unsuccessful attempt this error appears on the display. These closing attempts are carried out until the obstacle has been eliminated. The error message remains, however, to inform you of this fact. If the petWALK pet door is still open, you have to remove the obstacle. If the pet door is closed again, you should check which object has prevented the door from closing to avoid this situation in the future. Afterwards you confirm the error message by pressing the OK button on your remote control. Thus, the error message disappears on the display. E03 is displayed, if the door does not close within a given time period although the engine is running. The reason could be a loose slip clutch because of age-related wear and tear. This is not a restriction in normal operation. The slip clutch serves as an additional safety device in operating process to prevent pinching even in case of an electronic defect. Over time, the slip clutch can get loose due to normal use. This is absolutely no security risk, since pressure on an obstacle in the door will even get lower. But the grinding of the slip clutch accelerates the process of attrition, which may cause the effect that the clutch begins to slip even in normal operation and at some point will no longer close. In this case, we recommend servicing the petWALK pet door. You will find further information on our website. In the chapter "Frequently Asked Questions" you can also find more information on setting the slip clutch and under what conditions you can do this. When the door is still open, you have to remove the obstacle. When the door is closed again, you should check what could have prevented the pet door from closing to avoid this situation in the future. Afterwards you confirm the error message by pressing the OK button on your remote control. Thus, the error message disappears on the display. This error means that the input voltage does not match with the actual configuration of the pet door. This could happen e.g. if the door is connected to a 12-volt power supply and the battery pack is connected. In this case charging of battery is not possible. Confirm the error message with the OK button on your remote control. Thus, the error message on the display disappears. So the functionality of the pet door is not affected for a certain period. But you should switch to 24V input voltage as soon as possible in order to charge the backup battery for emergency operation or unplug the backup battery. This error code indicates that a tuning of the antenna is not possible, because e.g.the connection cables have been interrupted. The integrated RFID antenna is tuned automatically during initial installation and periodically once a day. If tuning fails the system shows this error. Confirm message with the OK button on your remote control. Thus, the error message disappears on the display. The pet door can still be operated but only by motion detection. To eliminate the error, please contact our service support team or one of our contractors. This error message is displayed with a simultaneous alarm signal when the petWALK pet door has lost the door contact in closed state and so has been forced open. If this error occurs, the pet door might have been broken up by force and needs to be repaired or replaced. You can disable this error message and the alarm signal by pressing the OK button. In very rare cases, this alarm can also be triggered, when a heavy object hits the pet door in the exact moment of the door starting the locking engine and so the pet door ruptures just before the blockage (e.g. due to stormy weather). In this situation, you will find your pet door with this error message in the closed state, since it was able to close during the next attempt. Then the error message refers to this problem and you just need to confirm with the OK button. The animal door is ready for use again. Nevertheless, you should check your pet door for damage. - Basically, the door panel is factory-set in the way that the silicon sealing is pressed against it with a gentle pressure and closes completely air tight. Over time, however, the pressure can change. - For a high quality closure, an asymmetrical mushroom cap is used, which enables that a manually opened pet door can be turned frontal with a TORX T15. By rotating (up to 360 degrees), the contact pressure of the door leaf can change. - Check that the protective foil at the bottom of the remote control has been removed. - Check that the battery is not inserted the wrong way. - The remote control works like your TV remote control with infrared. The transmitter of the remote control is located at the upper end, which needs to point towards your pet door. The range is up to 10 meters and decreases to the side. - The remote battery can possibly be empty. In this case, replace it by a corresponding new battery. - Check if the power is actually switched on (power socket, fuse). - Check if the connector of the power supply is actually connected to the door. In rare cases it can happen that the door stops responding. As with a computer, a restart will fix the problem in most cases. The easiest way is to unplug the power supply from the wall socket and wait until the battery is discharged and the door has shut down and all lights are extinguished in the display. This might take a few hours. Then plug in the mains power on again. The door will function normally again. If you own a "Large" model remove the inner cover of the door leaf. 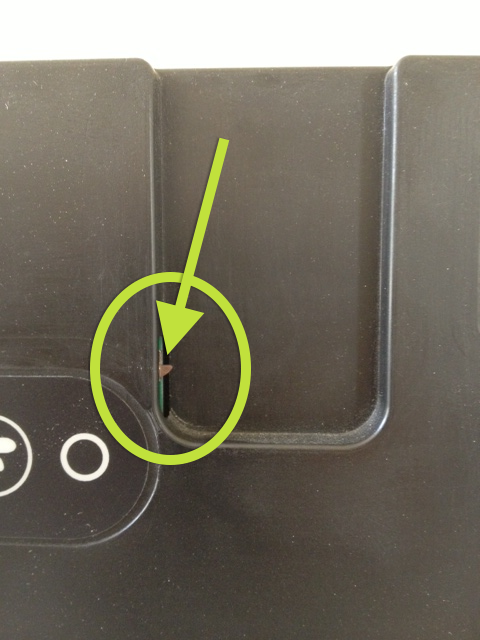 You will see a small slot on one upper corner of the door leaf and a locking bolt below it. On the model "Medium" you can access the bolts without removing the cover. Now move the upper bolt by means of a medium-sized screwdriver gently but with pressure against the resistance of the motor. You will hear a slight noise from the engine while pushing the bolts. This is normal and will not harm the door. As soon as you open the door panel slightly, it should trigger the burglary alarm. The display should show "A00" and an alarm sound can be heard. Hold the door leaf until you confirmed the error by pressing OK on the remote control. After that, the door should function normally again. If no alarm is triggered, you can remove the white battery connector with the red and black wires and unplug the power supply. When using an in-wall power supply you can switch off the fuse for a short time. Plug both in again. 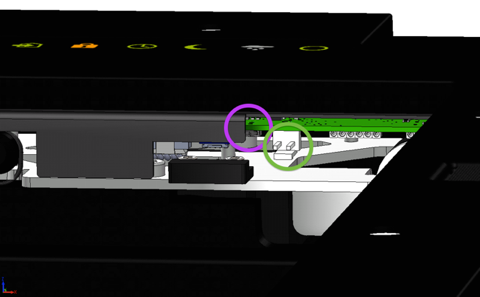 There's also a small reset button between the cover and the white battery connector in the area right above the white component, which protrudes slightly from the shroud. Here you could carefully press the reset button with a pen or similar. After a successful reboot the red circle appears in the display. After a rattling noise the pet door is initialized and ready for operation. What should be done if the locking bolts do not always open completely and are thus blocking the door? It could be that position of the door leaf is not correct and it is inclined. This can happen when the wing of the upper hinge has come loose and out of the door leaf for example by a blow. Our advice: check if the door leaf is properly positioned. You can check this easily by means of the gap distances on the outside of the door module. The gaps should all be about the same on all four sides and at the edge of the door leaf be parallel to the device. See little draft attached. If the door hangs down, you can beat the hinge bolt of the upper hinge (green arrow) with door leaf slightly open from the bottom out of the hinge block and screw the hinge wing into the door leaf by 1/2 to 1 turn to the right (clockwise) . Then reintroduce the bolt from above and test it. If the door leaf is well positioned now and the door opens properly, punch in the bolt again easily from above. What can I do, if the door doesn't recognize the implanted transponder? In the use of the supplied RFID transponder might not be an acceptable alternative, implantation of an additional chips might be an option. In this case, please test the chip before it is implanted. Once implanted it might be necessary to register your pet in various positions in front of the door, as the door reacts on the chip that responds first and in certain occasions the old one might still be quicker.